Everyone has made a New Years resolution, vowing that this will be the year that I lose weight, stop smoking, exercise more, eat better, or make more money. Perhaps you have even vowed to do all of those things at the same time! But by February, those resolutions have been forgotten, overtaken by life and old habits. Why is this; and how do we break the cycle? How do we actually achieve what we want from our lives? How do we reach our true potential? The key is setting goals. But first it is important to take a deep look at yourself and your life. What is truly important to you? What drives you every day? Why are you here? What is your true purpose? One of the worst feelings in life is to reach a goal; to climb that ladder, only to realize you are standing on the wrong rooftop. Once you know who you are and what is important to you, it’s time to set your goals. To be truly effective, goals must follow the SMART formula. Specific- goals must be specific so you know when you reach them. Measurable- it’s not enough to say you want to lose weight…how much weight? Achievable- if your goal is to lose 50 pounds in 2 weeks, you will quickly lose motivation because it will soon become apparent that you can not reach it. Relevant- it has to be truly important to you. Time bound- goals need to have a specific time frame that you will complete them in. Creating a goal that follows this formula puts you further ahead than 90% of people. But to truly bring your life to the next level, you need to follow that up with an action plan. Your action plan is the specific steps you will need to take to achieve your goal. You must break your goals into monthly, weekly, and daily tasks. You will need to define the actions necessary to achieve your goals. You must also be ready to deal with resistance. Resistance is the invisible force that gets in the way of your goals; the distractions and old habits that are hard to break. In the case of a weight loss goal, it would be that piece of chocolate cake that looks so good late at night. With a plan to defeat resistance, you are much more likely to reach your goals. Make this your best year ever!!! Go to www.nwabestyear.eventbrite.com to register for a 4 week intensive workshop focusing on setting on achieving your goals. Classes will be every Thursday in February (7, 14, 21, 28) from 6:30-8:30 pm at Arkansas Physical Health & Rehab 1583 Main Drive Fayetteville AR 72704. Cost is $100. 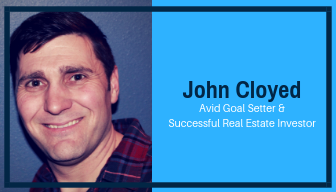 The class is taught by John Cloyed, an avid goal setter and successful real estate investor.